I have only been back to work for two days after having two weeks off and this is what I already look like. I feel very distressed because I have already lost a few very special patients and it is only Tuesday. However, part of being a veterinarian is you need to learn to store that deflation away to remain functional and effective in treating the rest of your patients. You must develop an emotional coping strategy that will help boost your spirits and help you digest losses and learn from them and maintain faith in your ability to save other animals. Different vets have developed their own individual emotional coping strategies. I am a very emotional person and losing a patient is usually written all over my face. I still somehow have developed a successful strategy where I can totally block off the sad thoughts and simply focus on the task at hand. It is like I click a switch and my brain goes into cruise control. I conduct my other consults to the best of my ability and do not go into reflective sulky mode until I am off work. Many vets can go through emotional fatigue if they are not careful. This is a true syndrome that can burn out many vets and can even lead to suicide. Vets come in second to dentists in having the highest suicide rates of any profession! So for any vet out there that is feeling blue and unable to pull him/herself out of that deep emotional hole, you must take time off. You need to take enough time off to be able to switch off, relax and feel good about life again. Now let me get back to the topic of losing a patient. I always wonder if euthanizing a patient is a better situation than losing him/her unexpectedly. What I mean is when you have a very critically ill pet and your gut feeling is saying ‘it is not going to pull through’. Isn’t it better to have put it down kindly and spared it any unnecessary suffering as opposed to discovering you lost your patient in spite of all the supportive care you have given to him or her? This is obviously a very grey area especially because there are always a few patients that defeat all the odds. I was very concerned to start my first day back at work and find my beautiful ‘Ruby’, a 10-year-old papillon, on a drip and looking very unwell. Unfortunately sometimes no matter how hard we try to help our patient pull through, we fail. As they say, you win some and you lose some. An unexpected death in a patient is one of the most challenging parts of our job. We think they are stable and have everything under control but then we are horrified to discover their limp body in the cage. One minute you are hand feeding them and feeling hopeful about their recovery and suddenly they are gone. And the worst part of it all is you have to break the terrible news to their owners. How can you offer those poor owners any consolation when you have no definitive answers? We can only speculate and discuss possibilities and the saddest part is, many owners are shattered by the fact that they were not there to support their animals in their final moments. This poor owner wanted to visit her dog this morning but we had to put her off until mid day because we had a lot of surgery to do. Guilt is eating my insides out and the only comforting thought I have is that Ruby got to have her mom cuddling her for quite a few hours yesterday! Today I cried so much while supporting my client in her grief. Usually I prefer to be strong for my clients, to be their sounding board, to help them accept the tragic loss. However, I could not be strong for Ruby’s mom. I simply felt her every tear and shook with her every shrieking moan. Words failed me. I lost my patient and I could not go back in time. Oh Ruby, you can not imagine how much I am going to miss your very expressive large fluffy ears. This afternoon I was also scheduled to see ‘Tom’, my handsome turkey. 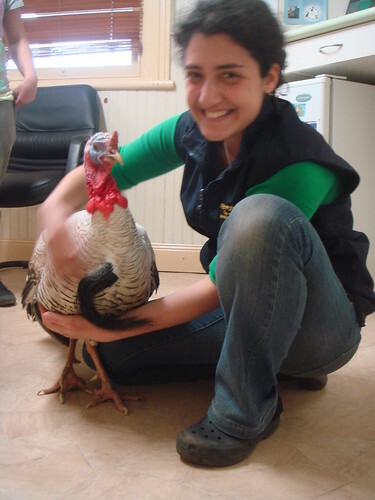 He was a much-loved and spoilt pet turkey that lived on a teaching farm. We had been managing his infected foot for quite a few months. We had consulted the bird specialist about him and his prognosis was guarded. He was going okay and coping with all the bandage changes and flushing of his infected joint but today it was time to let him rest in peace. 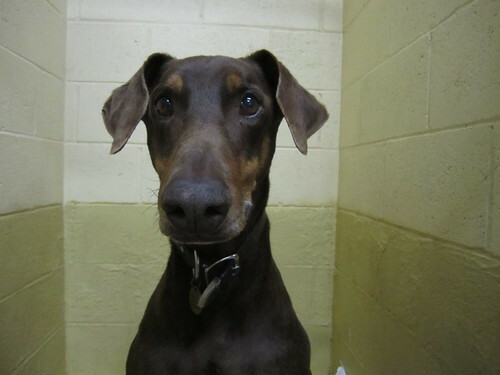 He was suffering from a very painful and swollen joint (septic arthritis) and had stopped eating for the past few days. It went very smoothly and he was finally at peace. The owner mourned his loss and felt relief that he is no longer in pain and I stood strong and supported her all the way. Tom, your drumming sounds and head colour changes will be equally missed. Below is a picture of him when he was doing really well and responding to our treatment. Lastly, to our dear ‘Stubby’, an 8 year old Jack Russell Terrier that had to be put down because of his suspect brain tumour. Your owner was very brave and could not to bear to watch you suffer for a moment longer. She drove 45 minutes in the dark just to hold and comfort you and say her goodbyes. For every person that has ever lost a very special pet, I leave you with this poem. After geeting my degree I’ve just started the hard way to becoming a vet. I’ve only been working for few weeks and I can say I love it. Last weekend I had to put down two of my pacients and it was a tough thing to do. Greetings from Barcelona (I also love the photos of your pacients xD). Hello Mar. Bet you are still enjoying the start of your veterinary career with all its ups and downs. Euthanasia is a difficult part of our job. I’d like to say it gets easier but I’d be lieing to you because it doesn’t!